Getting back to nature and immersing yourself in unspoilt destinations so different from your norm is an adventure for the mind and soul. 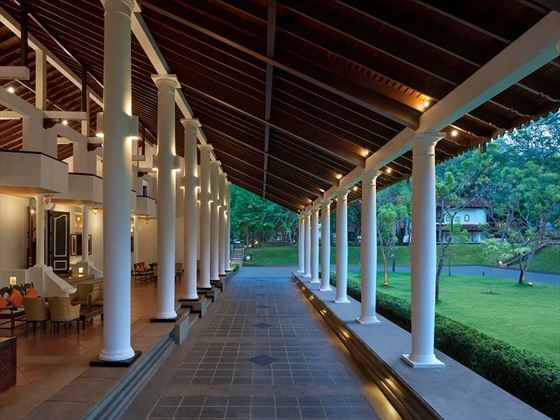 This rejuvenating experience is what inspires Cinnamon Lodge Habarana, a beautiful rustic-chic resort located in Sri Lanka’s North Central Province. 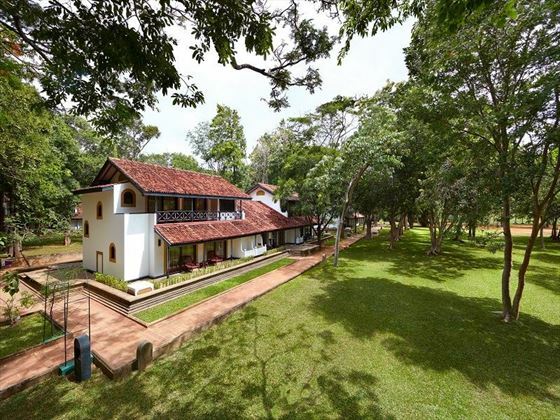 Built on a replica of the foundations of the nearby Ritigala ruins (an ancient palace turned monastery), the architecture and décor here have a regal resemblance, with warm gold and orange hues and scenic pathways that wind through the trees to each gorgeous retreat. Close by to Minneriya National Park, which is home to over 300 elephants, there’s a chance you’ll see some smaller but just as wonderful wildlife around the resort. 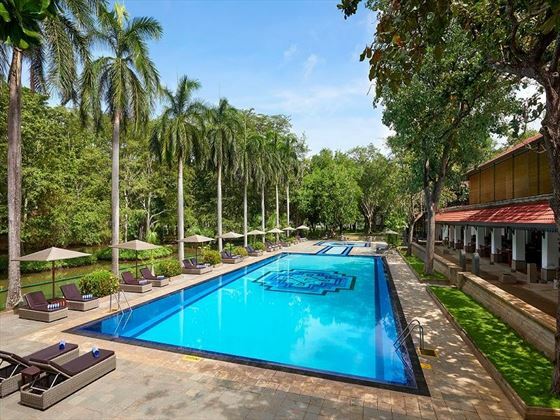 Relax by the pool as monkeys and squirrels chatter in the trees, or enjoy a Ceylon tea at The Veranda whilst listening to delightful bird call. The lodge has made the effort to restore its natural surroundings over the years, resulting in over 2000 trees being planted. The cuisine here is just as elegant at the rest of the lodge. 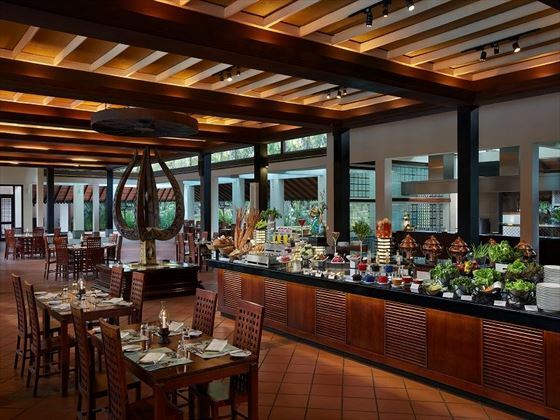 Ehala is a fantastic buffet restaurant featuring an array of different dishes – as well as a decadent dessert buffet, whilst The Lotus serves incredible food sourced from the resort’s very own farm. There’s ample opportunity for romantic destination dining too, including a secluded feast in the treetops, or a rose-petal strewn breakfast table right by the lake. 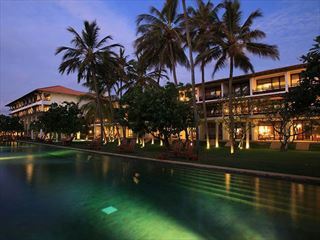 You’ll find this charming resort in the heart of Sri Lanka’s Cultural Triangle, in the dry zone of the island’s North Central Province. 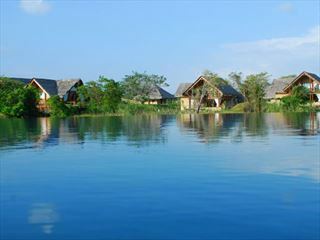 Just 10km from Minneriya National Park, it’s a beautiful, remote location that adds to the exclusivity for the resort. 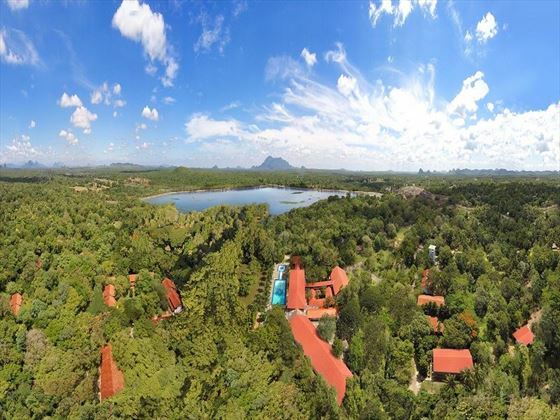 The retreat is also close to Sigiriya Rock, Polonnaruwa and the Dambulla Cave Temple, three of Sri Lanka's most popular attractions. 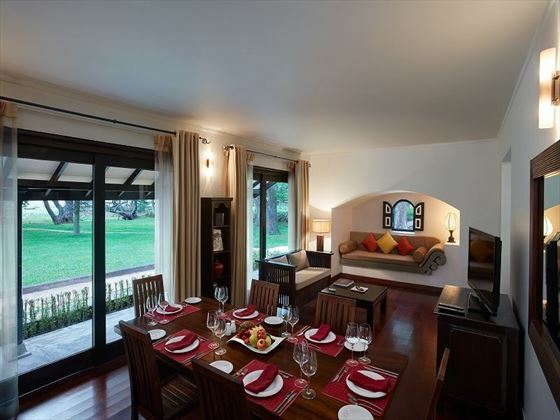 Superior Rooms – There are 68 of these spacious rooms, all connected via a scenic pathway that wind through the lush gardens. 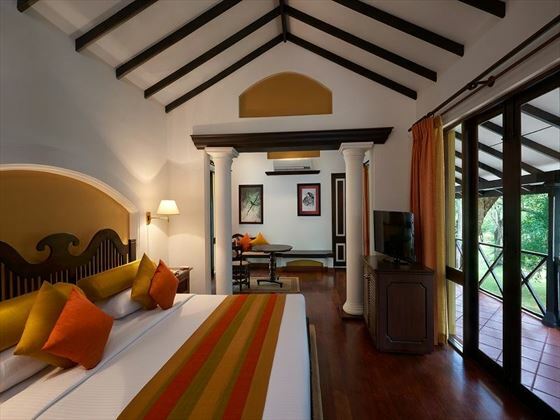 Each room has a gorgeous view of the crystal lake, plus rustic-chic interiors that match the ambience of the resort. There’s also a large living place. 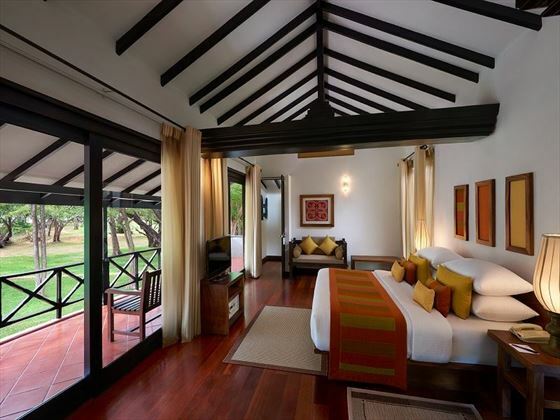 Deluxe Rooms – The main feature of these rooms is the king-size bed resting on an elevated podium, which is a lovely nod to the ancient customs of the Sri Lankan kings. 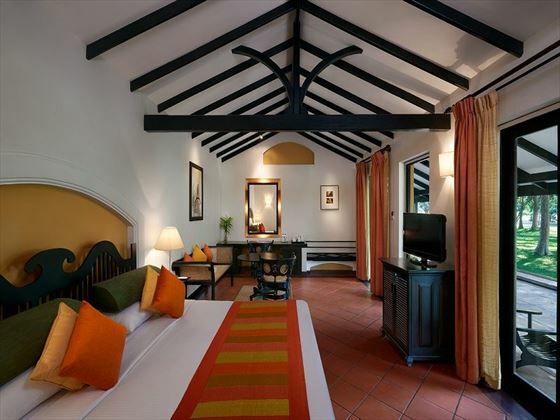 Each room adopts a modern look, with high beamed ceilings and terracotta floors, whilst also boasting pretty views of the gardens. Privileges also include having your bathtub filled ready for your arrival, private meals on your veranda, in-room spa treatments and butler service. 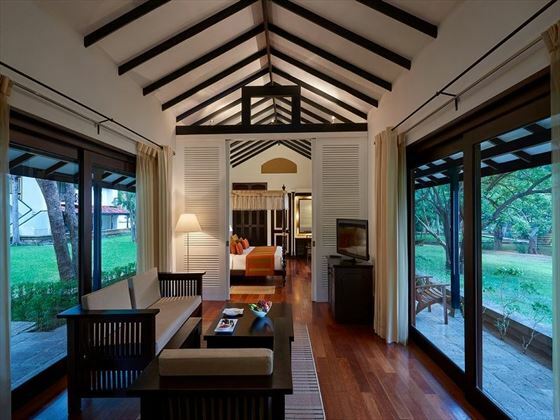 Superior Suites – There are only two Superior Suites – Banyan and Tamarind – with one floor, a lovely living area, the luxury of private in-room meals, and your own personal butler. Deluxe Suites – These expansive suites – named Ebony, Ivy, Cedar and Satin – have plenty of exciting luxuries, including two-storeys of space, a lounge and dining area, two bedrooms, a dressing room, and a Jacuzzi. 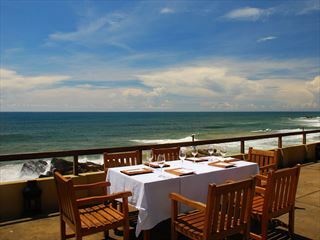 Ehala – A gorgeous open-air buffet restaurant, serving an eclectic spread of cuisines from around the world. After feasting on Sri Lankan curries and other delectable foods, wander along to the ‘Naughty Room’ for a taste of the delicious dessert buffet. 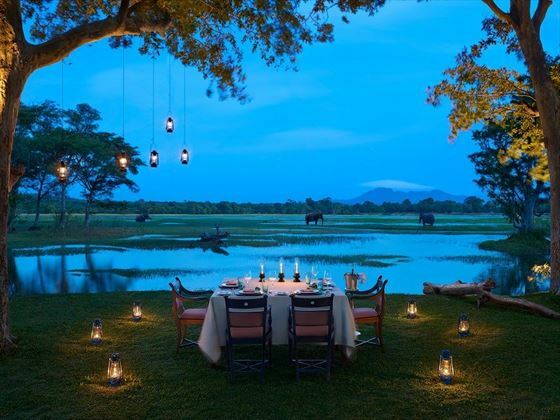 Tuskers – Named after the elephants that regularly visit the nearby national park, this colonial-style restaurant is a relaxing space to enjoy an early morning coffee or a night cap. The Lotus – A tranquil restaurant focusing on delicious ground-to-table cuisine, using only the freshest and most organic ingredients picked fresh from the resort’s farm each day. You can even wander to the farm yourself, pick up whatever produce you fancy, and take it back to the kitchens for the chefs to create something spectacular. 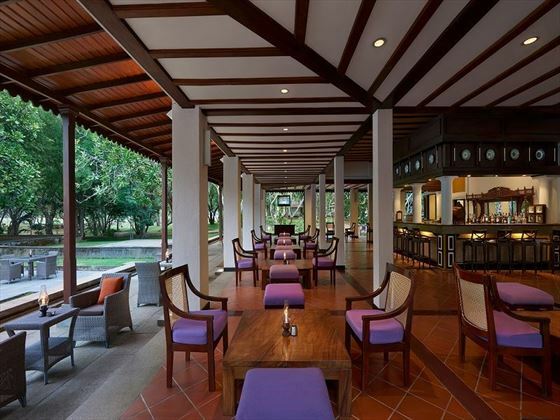 The Veranda – Enjoy a traditional Sri Lankan Ceylon tea at this airy, laidback venue. This open space overlooks the pool, and is a lovely quiet corner for enjoying a light meal and listening to wildlife chatter. Destination Dining – Romance is in the air at Cinnamon Lodge, so why not treat yourself to a private dinner in a secluded setting? From gourmet breakfasts by the lake and a decadent dinner high in the treetops, to an idyllic meal on the pier and a feast on a little island, there are many special dining options. Azmaara Spa – a soothing spa featuring a number of quiet treatment rooms where you can enjoy wonderful Balinese massages, body scrubs and wraps. Nestling among palm trees on 9 acres of pristine sandy beach. This first class boutique hotel is ideal for families and boasts spacious rooms with panoramic views of the beach and crystal clear waters of the Indian Ocean.